If you are looking for a super yummy, but easy dessert, this is the one for you. 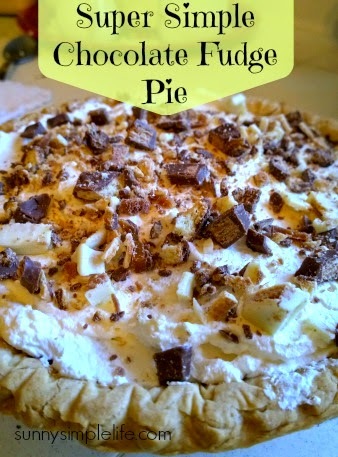 Super simple chocolate fudge pie is to die for and is so easy and quick to make. You can make this super duper easy by using a store bought refrigerated or graham cracker pie crust (which I do) and by using store bought pre-made whipped cream topping. I usually make my own whipped cream if I have time. Beat in a room temperature bowl the very softened cream cheese, adding one cup of the milk very slowly. Mix until totally whipped together. Keep the other 2/3 cup of milk chilled. Then add the other 2/3 cup of milk and the pudding mix and beat until thickened and mixed completely. Spread into the baked and cooled pie shell. Top with real whipped cream or a Cool Whip type of whipped cream. Sprinkle generously with your chopped candy bars or cookies of choice and refrigerate a few hours. Enjoy! Check out our recipe page for even more yumminess. I do not need to eat that yummy looking pie. I need to stop eating and get into shape. Wow, that looks amazing!!!! I would be in big trouble with that!!! Ummm yum Elaine. Now if my kitchen was done I could make it. It sounds and looks delicious! I pinned this one to try.